From the Missouri River System, the Red River to Devils Lake, we film a lot of great shows in North Dakota for a simple reason, the fishing is awesome. The Missouri River and Lake Sakakawea are favorite destinations for filming walleye shows. 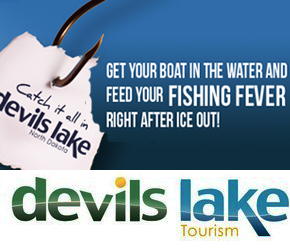 Devils Lake is our go to ice fishing mecca where we get some of the most extraordinary walleye and perch footage possible, not to mention great open water walleye material to use in our shows. The Red River is one of the most under recognized trophy catfish water in the United States. 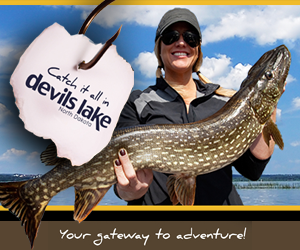 Devils Lake is one of the greatest ice fishing destinations in the Midwest for walleye, pike and perch but the open water walleye and pike fishing plus incredible waterfowl hunting opportunities makes this outdoor playground a must do. Jason Mitchell spent several years guiding on Devils Lake and earned a legendary reputation as a guide on this massive body of water. Unique open water patterns for walleye make this lake extremely enjoyable to film. Large, clean, beautiful rooms a stones throw from Devils Lake with excellent hosts. Devils Lake’s only full service resort right on Devils Lake. Kyle Blanchfield operates one of the nicest resorts in the Midwest, featuring a bait shop, bar, restaurant, lake side cabins, boat ramp, convenience store, motel, lodge units and campground. The Sleep Inn is Devils Lake’s newest hotel located right on Highway 2 as you enter Devils Lake from the east. This comfortable new hotel offers indoor swimming pool, hot breakfast, boat parking, indoor fish and game cleaning facility, dog kennels and large comfortable rooms. Only minutes away from great fishing. Fireside Inn is your Devils Lake ND hotel offering lodging that’s economical and offering remodeled rooms, plus free breakfast and hot tubs and pool.